The deadline for making representations on the New Ridley planning appeal looms fast, so I thought I'd outline the basic points I am making in my response. Before I do that, I will mention that Esh have now also submitted a new planning application to build 16 houses rather than the original 22. I am assuming that if the appeal goes in their favour then they will withdrawn the new application and proceed with the original, so this looks like Plan B in case the appeal is unsuccessful. iNorthumberland have now given a few more details of the planned availability of fibre-optic broadband for the Stocksfield exchange. I've talked about cabinets before, but here are a picture of two cabinets. The one on the top is part of BT's provision and the one on the bottom has been provided through iNorthumberland's scheme. It is not possible to say yet which properties are included in the total figure of 1273, but it is clear that this covers a good proportion of the exchange area. The information above (and more) can be found in iNorthumberland's West Area Update which you can download here. Until last week, the Branch End cabinet was showing as a "Future Exchange". Today it is showing as a "Coming Soon" cabinet with a forecast date of June 2014. I am hopeful that it will be even earlier than that, but it's nice to see it approaching all the same. Just as things were looking up for rural Northumberland in the superfast broadband stakes, the county council has taken action which, in my opinion, could leave many rural residents without access to a modern broadband service. 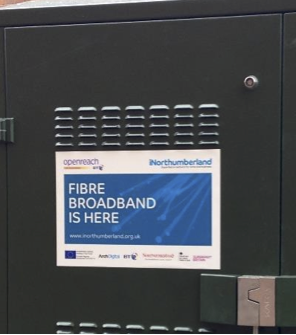 As you may recall from earlier posts, the current rollout of superfast broadband (being undertaken by BT (Openreach) in Northumberland) aims to connect 91% of households to the new fibre optic service. Depending on how far you live from your nearest cabinet this would see you getting speeds from between 2 Mbps and 25+ Mbps. The remaining 9% of premises not covered by the rollout would need alternative provision. 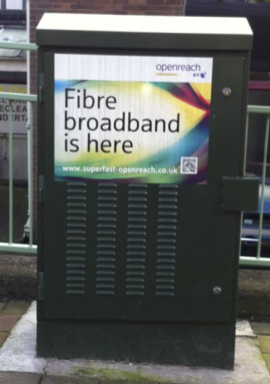 Back in 2011 the county council established the iNorthumberland project to ensure that the remaining 9% of premises would also see some uplift in their broadband speeds. The company formed to deliver this is the Arch Group. However, the county council have just made large cuts to the staff base at Arch Group including the Broadband Manager and his team. As some of the lowest levels of broadband usage in the country are to be found inNorthumberland I am deeply shocked by the news that key staff at Arch Digital have been removed. If the new broadband delivery team has been slashed then our most rural communities will be the ones to suffer. Our campaigning over the last 3 years has driven the extensive work done to try and deliver broadband to our most rural areas. We need County Hall to stick to its commitment to getting decent broadband to every property, not just those which will be reached now thanks to this Government's funding for BT to rollout to 91% of Northumbrian homes. Whilst I eagerly await the imminent arrival of superfast broadband here in Stocksfield I know that even here, owing to the rural nature of large parts of the area served by the Stocksfield telephone exchange, there are likely to be a significant number of residents who will not benefit from the 91% coverage. Without the broadband delivery team in place at Arch I am very concerned that these remaining households and small businesses will miss out on a vital 21st century service.